Sanz-Estébanez, S., L. Cordero-Grande, S. Aja-Fernández, M. Martin-Fernandez, and C. Alberola-Lopez, "Spatial and Spectral Anisotropy in HARP Images: An Automated Approach", International Symposium on Biomedical Imaging: From Nano to Macro (ISBI2016), Prague, Czech Republic, 2016. González-Jaime, L., G. Vegas-Sanchez-Ferrero, E. E. Kerre, and S. Aja-Fernández, "Spatially-variant noise filtering in Magnetic Resonance Imaging: A Consensus-based approach", Knowledge-Based Systems, 2016. 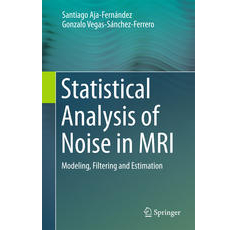 Aja-Fernández, S., and G. Vegas-Sanchez-Ferrero, Statistical Analysis of Noise in MRI. Modeling, Filtering and Estimation, , Switzerland, Springer International Publishing, pp. 327, 2016. Zhang, H., P. Casaseca-de-la-Higuera, C. Luo, Q. Wang, M. Kitchin, A. Parmley, and J. Monge-Alvarez, "Systematic infrared image quality improvement using deep learning based techniques", Remote Sensing Technologies and Applications in Urban Environments: International Society for Optics and Photonics, 2016. San-Jose-Revuelta, L. Miguel, and J. I. Arribas, "Three Natural Computation methods for joint channel estimation and symbol detection in multiuser communications", Applied Soft Computing, vol. 49, pp. 561 - 569, 2016. Pieciak, T., G. Vegas-Sanchez-Ferrero, and S. Aja-Fernández, "Variance Stabilization of Noncentral-Chi Data: Application to Noise Estimation in MRI", International Symposium on Biomedical Engineering: From Nano to Macro, , Prague, Check Republic, IEEE Signal Processing Society, 2016. Royuela-del-Val, J., M. Usman, L. Cordero-Grande, M. Martín-Fernández, F. Simmross-Wattenberg, C. Prieto, and C. Alberola-Lopez, "Whole-heart single breath-hold cardiac cine: A robust motion-compensated compressed sensing reconstruction method", International Workshop on Reconstruction and Analysis of Moving Body Organs (RAMBO/MICCAI) , Athens, Greece, 2016. Fuster, A., T. Dela-Haije, A. Tristán-Vega, B. Plantinga, C-F. Westin, and L. Florack, "Adjugate Diffusion Tensors for Geodesic Tractography in White Matter", Journal of Mathematical Imaging and Vision, vol. 54, pp. 1–14, 2015. Ramos-Llorden, G., G. Vegas-Sanchez-Ferrero, M. Martin-Fernandez, C. Alberola-Lopez, and S. Aja-Fernández, "Anisotropic Diffusion Filter with Memory based on Speckle Statistics for Ultrasound Images", IEEE Transactions on image processing, vol. 24, issue 1, 2015.
de Luis-Garcia, R., G. Cabús-Piñol, C. Imaz-Roncero, D. Argibay-Quiñones, G. Barrio-Arranz, S. Aja-Fernández, and C. Alberola-Lopez, "Attention Deficit/Hyperactivity Disorder and Medication with Stimulants in Young Children: A DTI Study", Progress in Neuro-Psychopharmacology and Biological Psychiatry, vol. 57: Elsevier, 2015. Aja-Fernández, S., and G. Vegas-Sanchez-Ferrero, "Blind Estimation of Spatially Variant Noise in GRAPPA MRI", International Symposium on Biomedical Imaging, pp. SuAT7.4, 2015. Sanz-Estébanez, S., S. Merino-Caviedes, T.. Sevilla-Ruiz, A.. Revilla-Orodea, M. Martin-Fernandez, and C. Alberola-Lopez, "Cardiac Strain Assessment for Fibrotic Myocardial Tissue Detection in Left Ventricular Hypertrophic Cardiomyopathy", XXXIII Congreso Anual de la Sociedad Española de Ingeniería Biomédica., Madrid, Spain., 2015. Casaseca-de-la-Higuera, P., P. Lesso, B. Mckinstry, H. Pinnock, R. Rabinovich, L. McCloughan, and J. Monge-Álvarez, "Effect of Downsampling and Compressive Sensing on Audio-based Continuous Cough Monitoring", 37th Annual International Conference of the IEEE Engineering in Medicine and Biology Society (EMBC), vol. 37, Milan, Italy, pp. 6231-6235, 2015. Simmross-Wattenberg, F., M. Martin-Fernandez, P. Casaseca-de-la-Higuera, and C. Alberola-Lopez, "Fast calculation of alpha-stable density functions based on off-line precomputations. Application to ML parameter estimation", Digital Signal Processing, vol. 38, pp. 1-12, 2015. Barrio-Arranz, G., R. de Luis-Garcia, A. Tristán-Vega, M. Martin-Fernandez, and S. Aja-Fernández, "Impact of MR Acquisition Parameters on DTI Scalar Indexes: A Tractography Based Approach", PLoS ONE, vol. 10, pp. e0137905, 2015. Aja-Fernández, S., D. García-Martín, A. Tristán-Vega, and G. Vegas-Sanchez-Ferrero, "Improving GRAPPA reconstruction by frequency discrimination in the ACS lines", International Journal of Computer Assisted Radiology and Surgery, vol. 10, issue 10, pp. 1699-1710, 2015. Aja-Fernández, S., A. H. Curiale, and G. Vegas-Sanchez-Ferrero, "A local fuzzy thresholding methodology for multiregion image segmentation", Knowledge-Based Systems, vol. 83, pp. 1-12, 07/2015. Curiale, A. H., G. Vegas-Sanchez-Ferrero, J. G. Bosch, and S. Aja-Fernández, "A Maximum Likelihood Approach to Diffeomorphic Speckle Tracking for 3D Strain Estimation in Echocardiography", Medical Image Analysis, pp. -, 2015. Gibson, R. M., A. Amira, N. Ramzan, P. Casaseca-de-la-Higuera, and Z. Pervez, "Multiple Comparator Classifier Framework for Accelerometer-Based Fall Detection and Diagnostic", Applied Soft Computing, In press, 2015. Royuela-del-Val, J., M. Usman, L. Cordero-Grande, M. Martin-Fernandez, F. Simmross-Wattenberg, C. Prieto, and C. Alberola-Lopez, "Multiresolution Reconstruction of Real-Time MRI with Motion Compensated Compressed Sensing: Application to 2D Free-Breathing Cardiac MRI", XXXIII Congreso Anual de la Sociedad Española de Ingeniería Biomédica (CASEIB), Madrid, 11/2015. Royuela-del-Val, J., L. Cordero-Grande, F. Simmross-Wattenberg, M. Martin-Fernandez, and C. Alberola-Lopez, "Non-Rigid Groupwise Registration for Motion Estimation and Compensation in Compressed Sensing Reconstruction of Breath-Hold Cardiac Cine MRI", Magnetic Resonance in Medicine, 2015. Martín-Martínez, D., A. Domingues, P. Casaseca-de-la-Higuera, C. Alberola-Lopez, and M. J Sanches, "PPG Beat Reconstruction Based on Shape Models and Probabilistic Templates for Signals Acquired with Conventional Smartphones", Lecture Notes in Computer Science, vol. 9117: Springer International Publishing, pp. 595–602, 2015. Curiale, A. H., G. Vegas-Sanchez-Ferrero, and S. Aja-Fernández, "Probabilistic Tissue Characterization for Ultrasound Images", Insight Journal, 2015. Royuela-del-Val, J., M. Usman, L. Cordero-Grande, F. Simmross-Wattenberg, M. Martin-Fernandez, C. Prieto, and C. Alberola-Lopez, "Single Breath Hold Whole Heart Cine MRI With Iterative Groupwise Cardiac Motion Compensation and Sparse Regularization (kt-WiSE)", Proceedings of the International Society for Magnetic Resonance in Medicine 23, 2015.